Here’s what it looked like at the beginning. 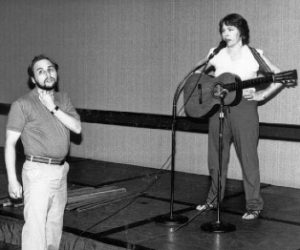 In the photo to the right, Joanna Cazden and Brian Toby run a sound check, probably at the very first official Caltech Folk Music Society concert on January 21, 1983. Brian and Simon Davies founded the Society to bring folk music to Caltech and the greater Pasadena area. Silly Wizard and Stan Rogers are just a couple of the outstanding performers who appeared in those early years. The series gained a following by presenting wonderful musicians, some very well known, and others, less known, but all incredibly talented. There were a few other early volunteers at this point, mostly students, but when Brian neared graduation, he sought out other volunteers to keep the music series going. The pool of future volunteers was those who had enjoyed the concerts up to that time. It took a diverse group of folks, mostly non-students, to form a committe, book shows and present concerts, but they were able to learn the many tasks and continue the series. Students and non-students have come and gone in the intervening years, but the Society has been able to maintain a very high level of performers, with people like Utah Phillips, Old Blind Dogs, Fairport Convention, John McCutcheon, and many others over the following years. See the complete list at the bottom of this page. The Caltech Folk Music Society celebrated its 30th anniversary on Saturday, February 9, 2013. It took a lot of people to get us through all those years, and we want to acknowledge them.